Winter is here – so it’s time to ignore your home’s exterior, correct! Tuff Industries thinks you should at least complete these vinyl deck tasks. Many patios and decks are access by French or sliding glass doors that can let out heat from your home. It’s a good idea to check around your doors (and windows) before winter sets in to ensure that everything is sealed. While you don’t *have* to shovel your vinyl patio or deck, you might want to, for a few reasons. First, it makes it easier to access your deck throughout the winter. Second, when spring comes, the snow on the deck will melt much faster so you can clean your deck and get ready to enjoy it. Finally, should there be a dumb of a significant amount of wet, heavy snow, you won’t have to rush out right away to clear it as your deck won’t have a winter’s worth of snow build up. If you’re going to clear your vinyl deck of snow (or at least a path and the stairs), then you’ll need to use something to add some traction to avoid slips and falls. 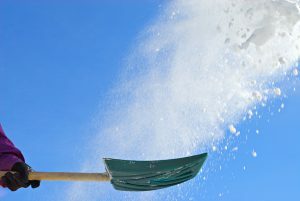 Rock salt and kitty litter (in moderation) are good options that don’t use chemicals and are relatively safe for any vegetation surrounding the deck or patio. Winter is the perfect time to start planning for a vinyl deck replacement, or a renovation to install a new vinyl decking surface and railings. Find a qualified contractor now and begin the first stages of your project, so once the snow melts you’re ready to get started. Winter might not feel like the right time to plan a springtime renovation, but if you wait any longer all the qualified builders will be booked up, and you’ll be stuck with your shabby deck for another year. Fall and winter are ideal for finding amazing deals on barbecues, outdoor kitchens, patio furniture and more. Check out your local home supplier, outlets stores, and online. Also, don’t forget second hand! Find local buy/sell boards and start following so you can find deals on gently used items that can save you 75% or more. If you’re looking for something in particular, think about posting an ISO (in search of) ad to see if anyone out there has what you need and is looking to part with it. We hope you have an awesome winter and enjoy the snow – but we’ll be here each week to get you ready to enjoy your vinyl deck come spring!